Aluminum Wire Market size was over USD 50 billion in 2017 and industry expects consumption at over 10 million tons by 2024. 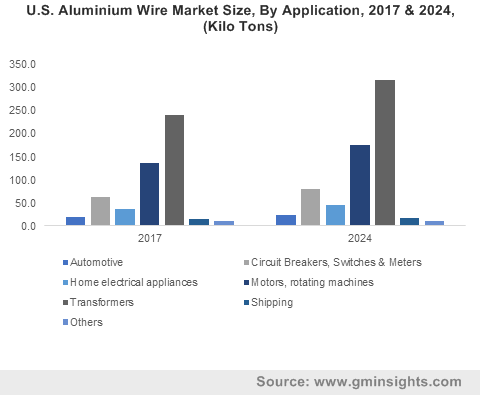 Increasing demand towards diverse, innovative product grades for electrical and automotive applications may stimulate aluminum wire market size. These are composed of aluminum which exhibit corrosion protection properties and find a wide array of usage in the products which includes transformers, building wires, electrical appliances and automotive. Wires including enamelled, fibre glass, nomex and paper insulated are used in various industrial segments owing to their exceptional characteristics, thereby stimulating industry growth. Global primary aluminium production was over 5 million tons in 2017. It is an electronegative metal and possess strong affinity for oxygen. It is majorly applied in food & packaging and medical industries owing to its non-toxic nature which preservers food for longer period and averts the growth of microorganisms. Moreover, its electrical conductivity, corrosion resistance, reflectivity and reusability are the properties owing to which these are widely used in electrical transmission lines which in turn stimulates the aluminum wire market demand. Global automotive market sales were over 95 million units in 2017. These are particularly used in automobiles to reduce the vehicle weight to upsurge fuel economy. The manufacturers are now substituting steel frame with aluminum which reduces the body weight without compromising on strength and carrying capacity of the vehicle. These products when used in automotive systems it reduces the weight of wiring system by 48% which saves weight and trim cost, which in turn boosts industry growth. Increasing demand for light vehicles in automotive sector which reduces vehicles weight by 20% are some of the key factors driving aluminium wires market. Global consumer electronics market was valued at over USD 1 trillion in 2017. These wires are used in home appliances such as switches, frying pans and rice cookers as aluminium oxides forms an insulating layer which in turn provides metal-to-metal contact and enhances safety to customers, thereby driving product demand. Growing R&D efforts by producers to attain effective production and higher product development may boost market growth. Copper wires act as a substitute and are less costly compared to aluminum wires owing to their properties which includes high ductility, strength of fractures and high electrical conductivity which makes them desirable in various applications, which may hamper market growth and affect price trend. Enamelled round & rectangular aluminium wire market demand was valued at USD 25 billion in 2017. The product is majorly used in transformers owing to their light weight and heat resistance properties towards transformer oil. These products are mainly used as electrical conductor wherever coils are in motion which includes industrial equipment like refrigerating systems and generators is likely to foster product demand. Paper insulated round & rectangular aluminum wire market size may register gains close to 3% over the forecast period. The products are oxygen free electrical wires which are drawn by certain size of mold in which every layer of paper twine conductor continually without getting any wrinkles. Superior properties of the products including resistance to abrasion and solvent, electricity performance, heat shock and rise the filling coefficient of the transformer will foster the product demand. Fiber glass insulated round & rectangular aluminum wire market size may surpass USD 3 billion by 2024. The product provides efficient insulation in coil winders with higher thermal stability, electrical properties and resistance to abrasion. These are suitable for windings in electric motor stators, generators and in special transformers owing to their high degree of insulation. Aluminum wire market size from automotive applications may be valued at over USD 2 billion at the end of 2024. These products are utilized in automotive wiring harness application as it reduces the vehicle weight by around 48%. It also improves flexibility and improves metal-to-metal contact between the terminal and the conductor which averts galvanic corrosion, which will propel product growth. Aluminum wire market demand from circuit breakers, switches & meters application was witness growth at over 3% by 2024. These are used in many light bulbs and other connectors to improve quality of electrical applications and provide high voltage. Proper installation and choice of wire aid to prevent corrosion at connections, thereby driving product growth. Aluminium wire market demand from motors, rotating machine application may surpass USD 15 billion by 2024. These products are generally used in motors where the ratio of wire to iron is relatively low and are found in application where the motor runs irregularly, and efficiency is a major factor, which in turn stimulates the product demand. North America, driven by Canada and the U.S. aluminum wire market size may register significant growth at over 3.5% by 2024. The products in construction industry are utilized for electricity transmission and distribution which is considered safe for building and home wiring with a shelf life of 40 years. These wiring exhibits high tensile strength and oxide film properties which act as a source for electrical connections, thereby driving the regional growth. Europe aluminium wire market demand driven by Germany, UK, France, Italy and Netherlands was valued at over USD 10.5 billion in 2017. They are utilized in green building concept as the products are applied in on building facades, roofing systems, curtain walling and in window frames as it provides insulation and allows daylight & fresh air into buildings, thereby stimulating the product demand. Asia Pacific driven by India, Japan, China aluminium wire market size may register significant gains at 3.5% by the end of foreseeable timeframe. These are used in various construction application which includes wiring systems owing to its high strength, durability and less risk of breakage coupled with cost cutting and weight saving properties, which in turn stimulate regional demand. Global aluminum wire market share is consolidated with General Cable, Southwire, Nexans, REA and Sam Dong. These companies are involved in joint ventures and mergers to develop their regional presence and are focusing on new technology to gain feasible benefit which may foster the product demand. Moreover, many industrial participants are advancing in regions where the government is taking initiatives to advance its infrastructure facilities and reinforce the global presence. Aluminum wire is drawn by hot rolling in which rods are formed followed by solution handling and quenching of the coils attained by hot rolling. 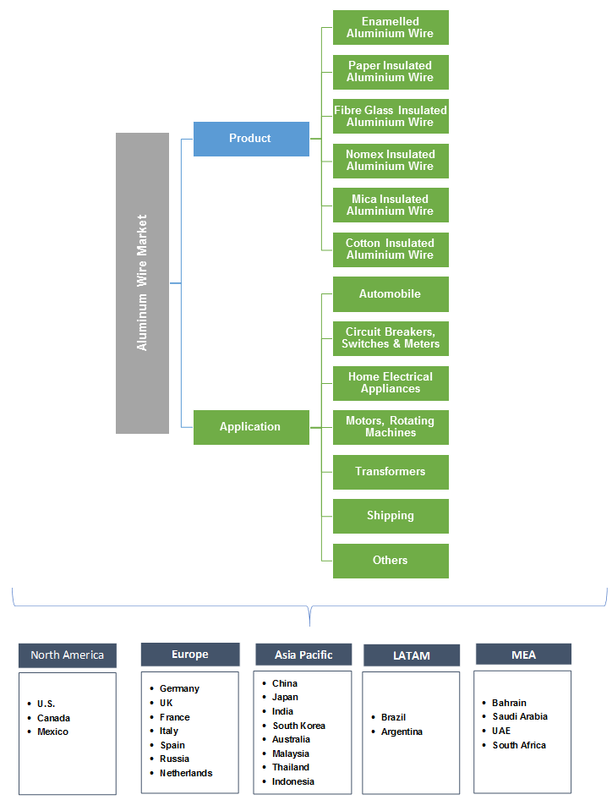 Increasing demand for light weight automotive vehicles and stringent performance requirements in electrical machines is likely to propel product demand. In electrical application these are used in transformers as their oxides are strongly attached, hard to dislodge and are electrically insulated. High tensile strength property can be tailored, and its lighter weight require few support towers for overhead transmission lines, which offers more growth opportunities in the market.